To construct a reporter gene cassette consisting of aeBlue reporter and gentamicin resistance selective marker, and attC site. The cassette must be cloned into standard iGEM pSB1C3 backbone with all sequences void of forbidden restriction sites as per iGEM requirements. The cassette must be easily recovered as a circular product from the backbone for further work. The BioBrick parts were ordered as a synthetic gBlock from IDT, along with primers to amplify the entire gBlock by PCR. pSB1C3 linearised backbone was amplified by PCR using new primers to re-introduce the full biobrick prefix and suffix. The two parts were joined by restriction-ligation using EcoRI and PstI. 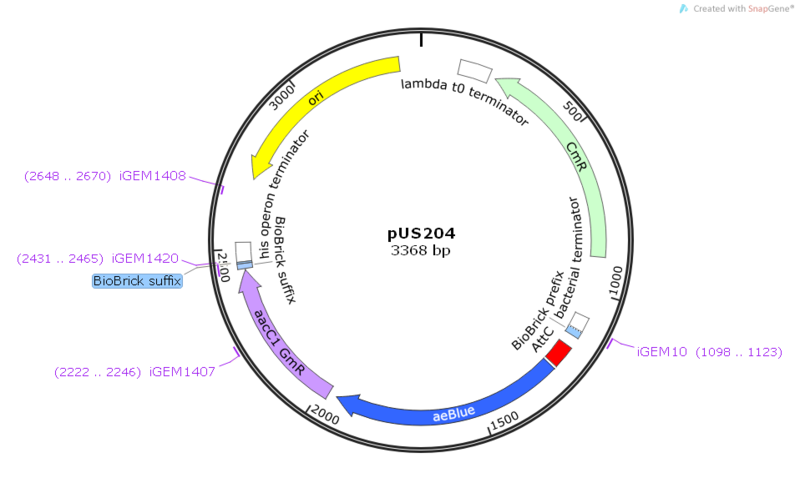 The components were assembled as a circular plasmid in the order: pSB1C3 → AttC → aeBlue → aacC1 GmR→ pSB1C3. To retrieve functional cassettes, PCR primers containing compatible but non-identical restriction enzyme sites (XbaI and SpeI) at the end. 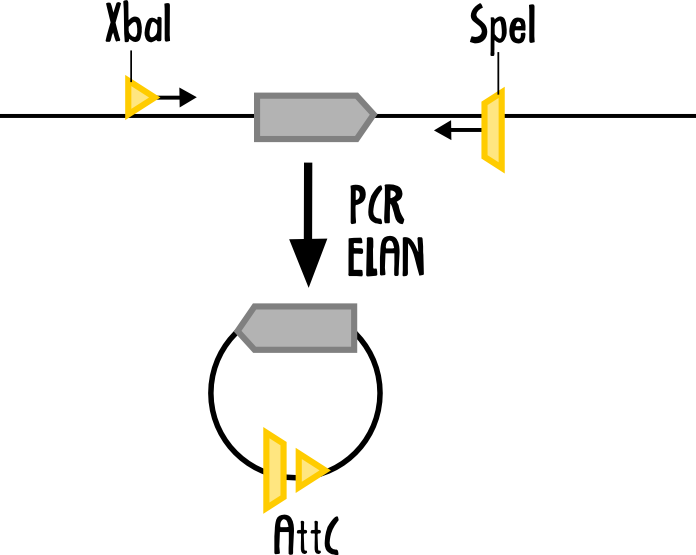 From PCR products, circular cassettes were generated using Enzymatic Ligation Assisted by Nucleases (ELAN) via the XbaI and SpeI sites. To validate the function of the cassette, PCR products of the aeBlue-GmR gBlock were subjected to ELAN to produce circular cassettes. The original PCR and the ELAN were then run on a gel to confirm that indeed new products were being produced. ELAN reactions were repeated, and transformed into JM109 E. coli containing pUS44 and pUS42, two plasmids previously shown in NVC lab to contain functional AttI site with Pc promoter, and constitutive integrase respectively. When plated on Gentamycin resistant plates, we should see selection of transformants in which the cassette has integrated into the AttI1 site in pUS44, thereby becoming gentamycin resistant. As expected, we observed a lot of growth of Gm resistant colonies, ~50% of which grew again when re-plated onto Gm plates. However, none of these colonies were the expected blue phenotype, indicating that there were issues with the aeBlue reporter gene.